Compare prices from several car hire companies in Lanzarote Airport and find the best price for car rental. Our prices always include unlimited mileage and insurance. Lanzarote Airport (ACE) is located on the east side of the island of Lanzarote, which is part of the Canary Islands off the African mainland. It is only 5 km to the island’s capital Arrecife, and the bus line 4 runs every half hour. By car follow the road east LZ-2, or you can use one of the taxis waiting outside the arrival hall. 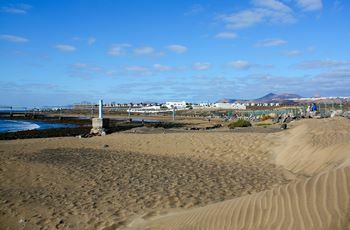 In 2010 it was registered almost 5 million passengers here, making Lanzarote Airport to the tenth busiest airport in Spain. Companies like Thomas Cook, and AirBerlin EasyJet offer flights to and from Lanzarote, and destinations include Madrid, Barcelona and Amsterdam. The airport boasts good and various facilities, including bars, restaurants and eateries such as Burger King, various shops, duty-free shop and VIP area.